Oh, autumn is so lovely! It's all about the good things: sharing, warmth, family, thankfulness, and God. And Halloween, but us 'churchy' types tend to gloss over that in favor of "Trunk or Treat" or "Nut Night" or similar church-directed activities. Don't get me wrong, I'm all about church-directed activities, and I myself enjoyed many a "Nut Night" dressed as a clown, or a bunch of grapes (that was a moment of genius on my mom's part, not gonna lie). 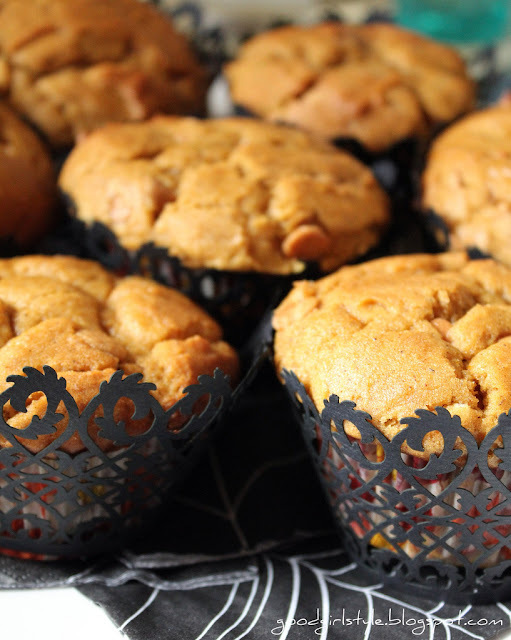 All of that is to say, I generally don't 'celebrate' Halloween per se, but I'm not above some orange pumpkin muffins with Halloween-y themed decorations. 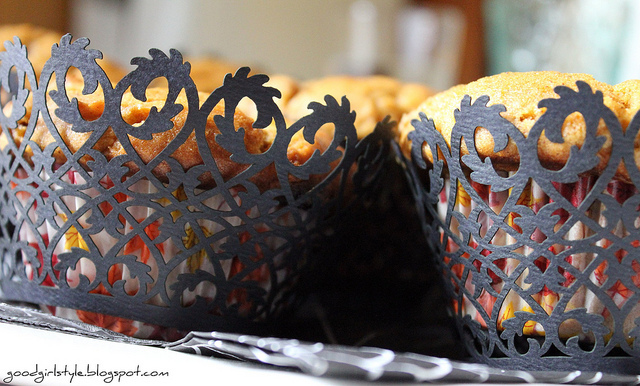 Like fall leaves cupcake liners, cemetery gate-inspired cupcake holders, and spiderweb napkins. 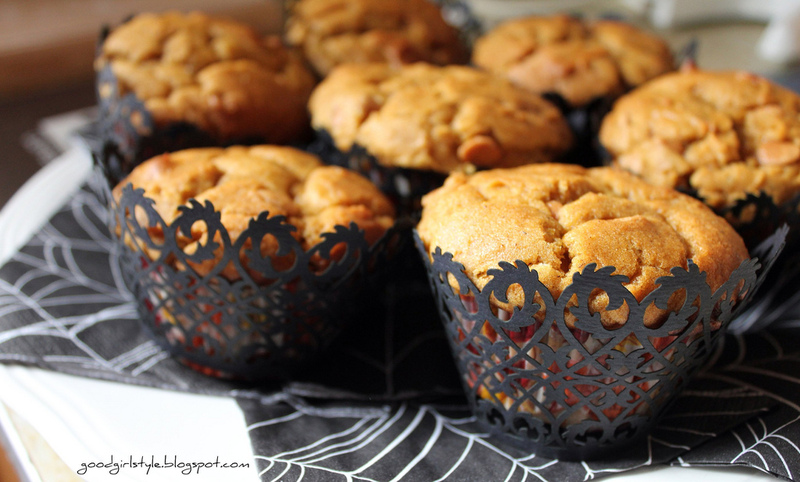 Now let me tell you my secret: These are PEANUT BUTTER PUMPKIN gluten-free muffins (using this recipe from King Arthur Flour and all-natural Sunspire Peanut Butter chips!)! And they are delicious. Now don't give away my secret, or I may have to release the bats & spiders! Muahahahahahahahahaha. The napkins & cupcake liners, of course. 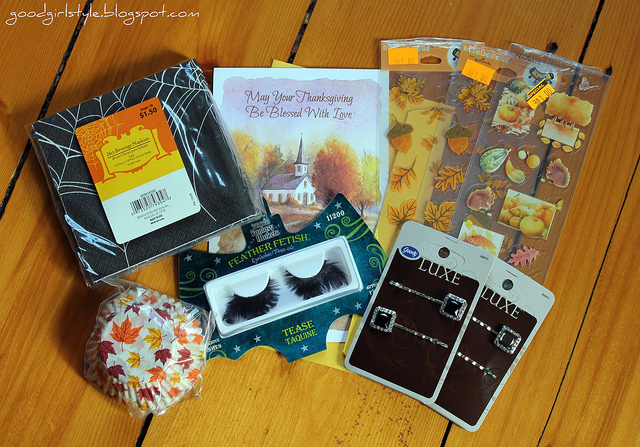 And some feather eyelashes cause I'm a dork and I want to try them (and because boyfriend said he would laugh at me if I did), some pretty hair clips, Thanksiving cards & pretty stickers to seal them with (3 for $1)! I was a bunch of grapes too! And a pile of leaves! Those are SO CUTE! They're so beyond perfect for halloween. I think I might borrow your idea and make some of these for my little halloween party. so cute! I love those little muffin holders. So festive. Have a great weekend! I love dollar store finds! Also, those muffins looks to-die-for! I love the little sleeves they're in- Adorable. I love those cupcake holders!! So adorable! everything looks amazing! you are officially making me hungry :) love your scores at the dollar store by the way..
Hi Natalie! I loved reading this post! I'm super excited to try out this peanut butter pumpkin recipe!! The black liners are adorable. Thanks for sharing :o).